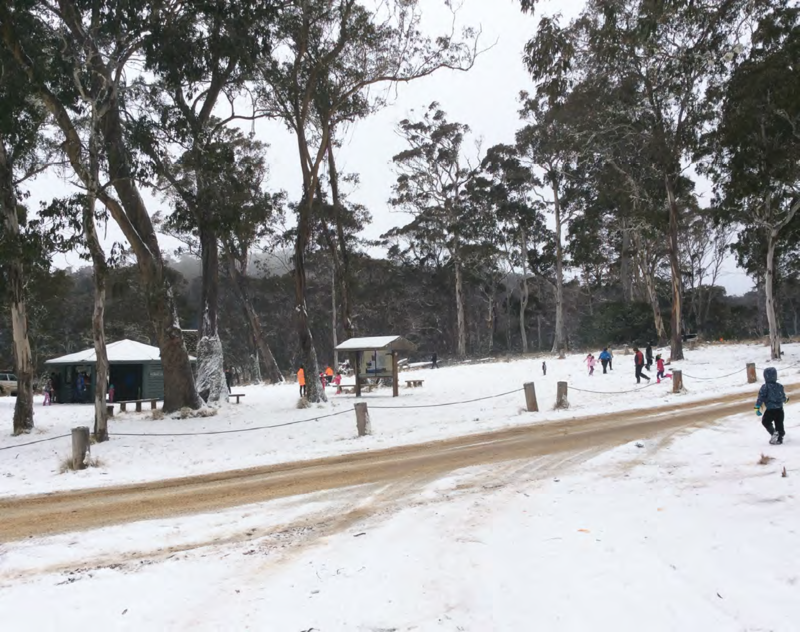 “Snow in the Barrington Tops this weekend.” We thought this was a good chance to try out our A.T.G.W. 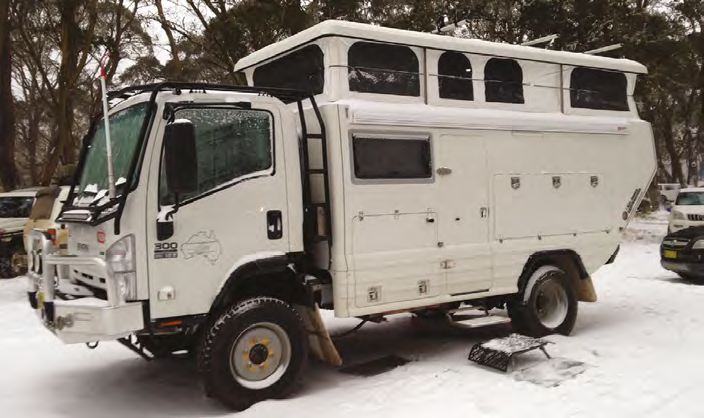 (All Terrain Global Warrior) in the cold conditions. So after a Friday afternoon shop that included filling the fuel tanks, we also collected the grandson. On Saturday morning, after a three-hour drive up to the Barrington Tops National Park, we arrived at the Polblue campground. The air was dry and crisp and the park nearly empty. With the ground still dry and hard we found a large clear area just right for us to park on. During a walk around I chatted to the other campers; a group of three dome tents with a large fly over them, a couple of hard-floor campers and a 20-foot caravan over under the trees. However, one person was sleeping in a hammock with a below-zero sleeping bag and a fly over the top! We all sat by the fire until it was very dark and with a light rain. This was followed by a strong wind, so we were quickly to bed leaving the fire on its own. About three hours into our sleep Marilyn woke me up to tell me that it wasn’t raining, it was all quiet. I rolled over and went back to sleep, awakening to the sun coming through the window over the bed and the air temperature comfortably warm. I got up and walked to the door, when I opened it and looked out I was greeted by the sight of everything covered in three inches of beautiful white snow. All the brown grass was gone, there was snow everywhere. The air was crisp and I mean really crisp. With my boots and jacket on and camera in hand I went outside; no wheel tracks or footprints in the snow – it was a postcard photo. The hammock guy was up but he looked a bit ‘cool’, while the caravan was being hooked up, the owner said he was leaving before the crowd arrived. He was right. By lunch we were surrounded by hordes of day-trippers, but they didn’t see it when it was a postcard picture. We decided to go down before it got dark but there were hundreds still coming up – some vehicles required winching out of the drain on the side of the road. Our experience was beautiful and the trick driving in the snow is slowly using four-wheel drive and do not use your brakes too aggressively. Always try to keep your wheels turning. This information has been sourced by Barrington Tops Tourism, and you can find out more by clicking HERE. 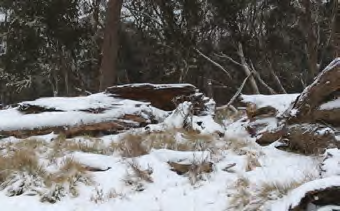 Access to Barrington Tops is via a steep unsealed road and in snow or rain can become very slippery with ice and mud. With high vehicle usage the road can be boggy and corrugated with large potholes. In these conditions a 4WD is recommended for safety, preferably a 4WD with good ground clearance and suitable off-road tyres. Snow chains aren’t required but lowering your tyre pressure may improve traction and reduce damage to the road. Check that your tyres have good tread and avoid any sudden moves on the brake, accelerator and steering wheel. Keep to a low speed and slow down by taking your foot off the accelerator rather than using the brakes. If you do use your brakes apply them gently on the straight before coming into the corner. Use gradual acceleration and keep your momentum up slopes. Leave extra distance between you and the vehicle in front. Weather conditions can change quickly so be prepared. As a minimum take warm clothing, blankets, food, water and spare dry clothes. 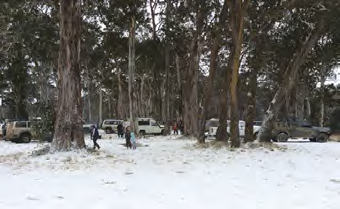 The Barrington Tops Forest Road can be closed at short notice due to ice or heavy snow. Other seasonal road closures occur between June 1 and September 30. You can find more information on Barrington Tops road closures by clicking HERE. WHERE CAN I SEE SNOW? The Polblue camping area at 1450m and Devils Hole lookout at 1400m on the Barrington Tops Forest Road are good places to start. You can find more information on where to find snow by clicking HERE.